Benn Challen bagged six wickets in a fine bowling effort to help Sussex League Division 4 West promotion-hopefuls Broadwater to a ninth victory of the season on Saturday. Challen collected figures of 6-20 from nine overs as Billingshurst's 2nd XI were bowled out for just 95 in reply to Broadwater’s 230-8. The home side recovered from an early wobble with the bat, finding themselves 25-3 at one stage, before Joel Lewis (56) hit a half-century and Keir McCarthy (49) stood up to get Broadwater over 200. Broadwater, who have won five successive matches, are putting more distance between themselves - in second - and place-below Chichester Priory Park 2nd with each passing week. Chichester suffered a second successive defeat at the weekend, which means Broadwater have opened up a 59-point gap in the promotion places with five games left to play. However, skipper Nigel Waller is remaining coy on Broadwater’s promotion chances. He said: “I’ve said all along that our aim is to enjoy our season and win as many matches as we can. We’ve been doing that and over two thirds of the way through the season, we have now put ourselves in a great position to finish in one of the two promotion spots. Broadwater were asked to bat and struggled early in their innings. Graham Waller went first ball then Benn Challen (five) and Gareth Challen (one) went cheaply to leave the home side in trouble at 25-3. Opener Paul O’Sullivan (41) was joined at the crease by innings top-scorer Lewis (56) and they put on 78 for the fourth wicket. McCarthy then weighed in with a valuable 49, while Chris Green struck 26 as Broadwater ended their 53 overs on 230-8. Only opener Sam Goodway (18) reached doubled figures as Billingshurst's batsmen were blown away by a combination of Benn Challen, who moved on to 38 wickets for the season - the most in the division - with 6-20 and opening bowler James Salisbury (3-49). McCarthy followed up his 49 with the other wicket as Billingshurst were all out for 95 from 24.4 overs in reply. Skipper Nigel Waller was impressed by Broadwater’s recovery from an early wobble and said: “I was pleased with our efforts. We didn’t get off to a great start with the bat but it was good to see the middle to late order all get a chance to bat, given that hardly any of them have been needed this season and also good to see them do well. 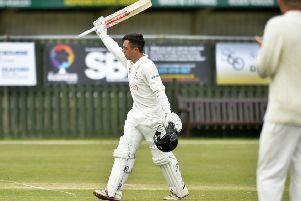 "Joel batted really well for his 50 with excellent contributions from Sully (Paul O’Sullivan), Greeny (Chris Green) and particularly Keir getting 49 at number seven.